Solar energy is one of the areas of renewable energy, which is based on the direct conversion of solar energy into other forms of energy, such as electricity or heat. Solar energy is environmentally friendly industry, whose development is driven by economic factors (increasing of prices for traditional energy sources while reducing the cost of equipment using renewable energy), and programs of state support (for example, «green tariff») existing in many countries. The issue of the solar system performance is one of the first that people ask when planning to invest in solar power. The amount of electricity that will be produced with the help of the solar module depends on many factors, including the geographical location of the solar power plant. 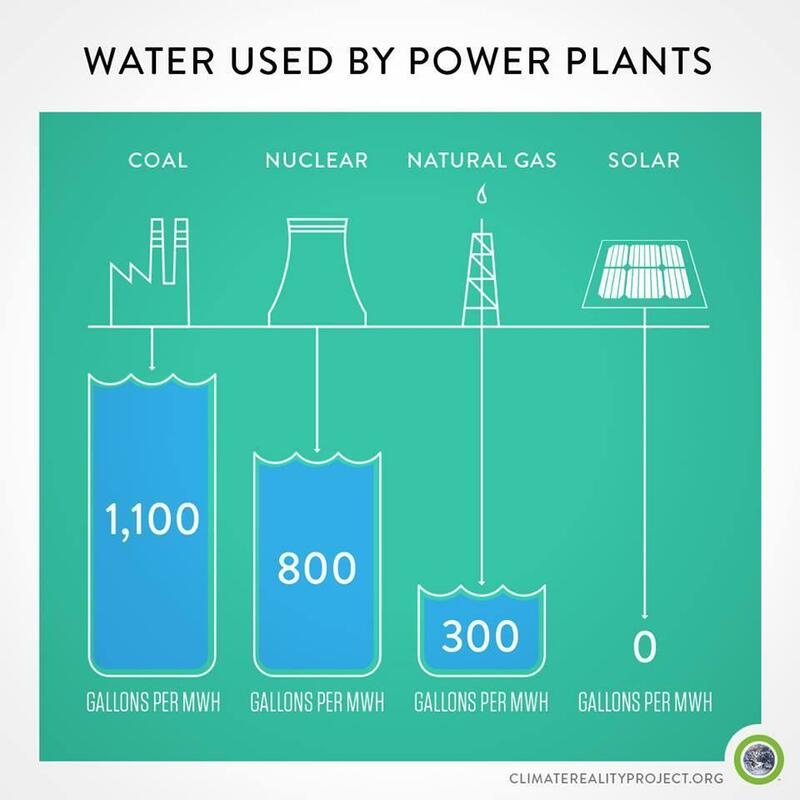 At all other things being equal the amount of electricity produced is direct proportional to the amount of solar radiation reaching the earth’s surface at the solar power plant location. Solar energy is one of the environmentally sustainable resources for producing electricity using photovoltaic (PV) systems. The main input data used in the planning process is solar radiation. 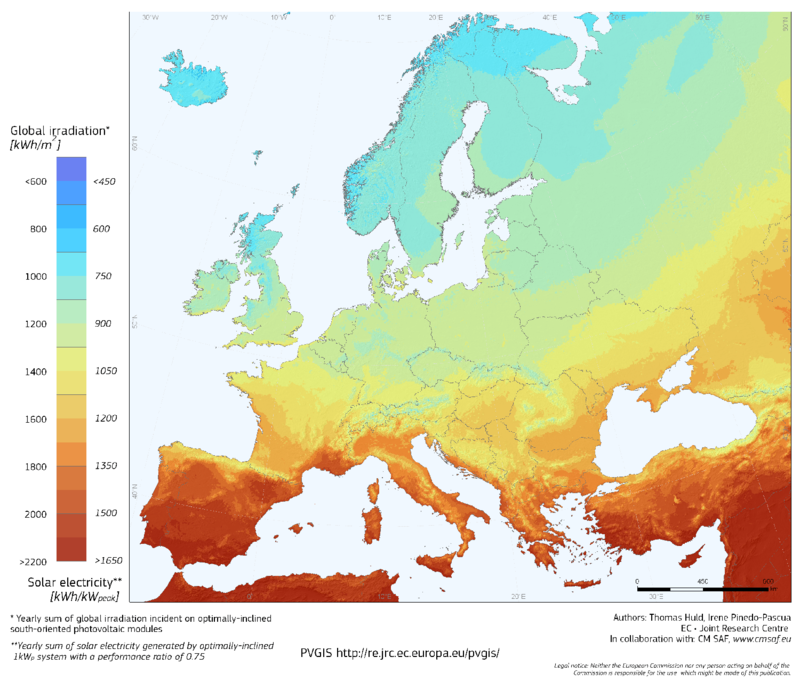 Photovoltaic Geographical Information System (PVGIS) has developed a solar radiation database from climatologic data homogenized for Europe and available in the European Solar Radiation Atlas. The model algorithm estimates beam, diffuse and reflected components of the clear-sky and real-sky global irradiance/irradiation on horizontal or inclined surfaces. The geographical location of Ukraine is good for using of solar energy technologies. 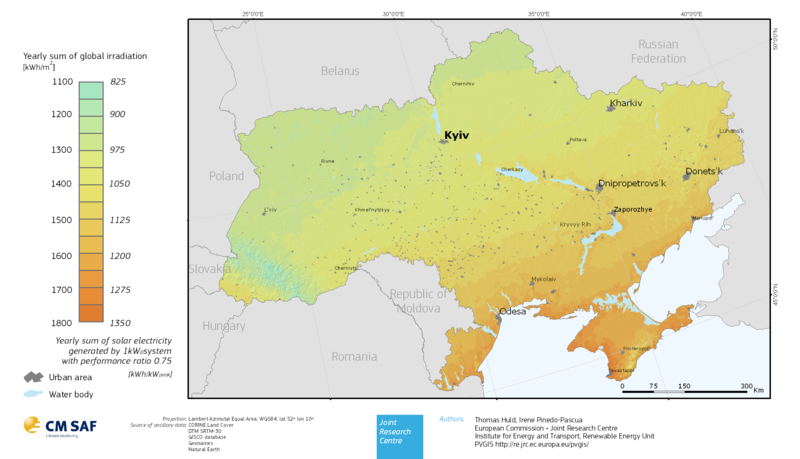 On the maps below you can see the solar potential of Ukraine and compare it with irradiation in other European countries. This industry is actively developing worldwide . Large prospects of the industry — annual amount of solar power plants throughout the world increases by 20-25%. The amount of solar energy incident on the surface of the Earth this week, higher than the energy the world’s reserves of oil, gas, coal and uranium combined. In Ukraine, quite favorable climate — amount of solar energy reaching the Earth’s surface in terms of 1 sq.m higher than for Germany, which is the use of solar energy is one of the most progressive states in the world. Currently in Ukraine has developed sufficiently favorable legal framework for the development of solar energy — has one of the highest among European countries FIT rate guaranteed by the Goverment.